Haystack Butte is located on the north banks of the Columbia River at River Mile (RM) 205, approximately 3 miles downstream of the Maryhill Museum, and directly across from Miller Island and the mouth of the Deschutes River. Haystack Butte is part of the Columbia Hills, an anticline of the Columbia River Basalt Group (CRBG). 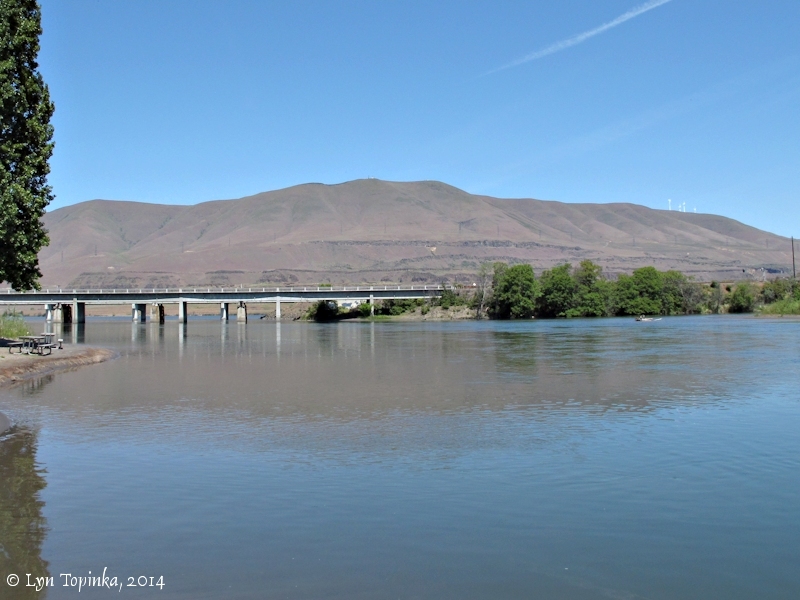 Lewis and Clark and the majority of the men spent the night of April 21, 1806, on the Washington side of the Columbia River two miles upstream of Wishram at the base of Haystack Butte. 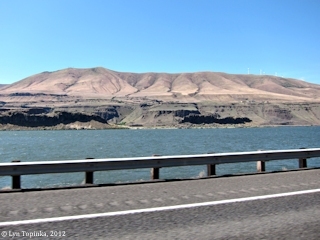 Lewis and Clark and the majority of the men spent the night of April 21, 1806, on the Washington side of the Columbia River two miles upstream of Wishram at the base of Haystack Butte, across from the lower tip of Miller Island and the mouth of the Deschutes River. 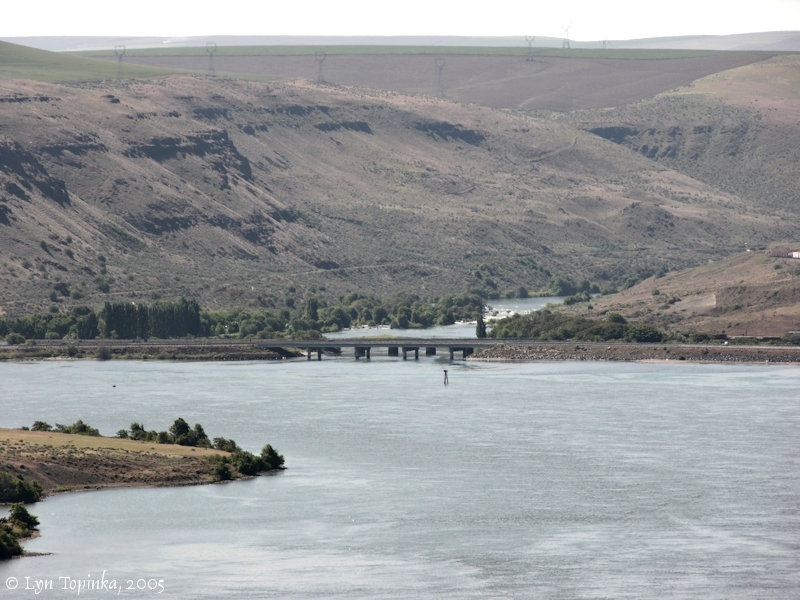 In these passages Captain Lewis refers to the Deschutes as "Clark's River" and Captain Clark refers to it by the Indian name, the "To war nah hi ooks" River. On the night of April 21, 1806, Patrick Gass and three other men did not make the river crossing to rejoin the main group. 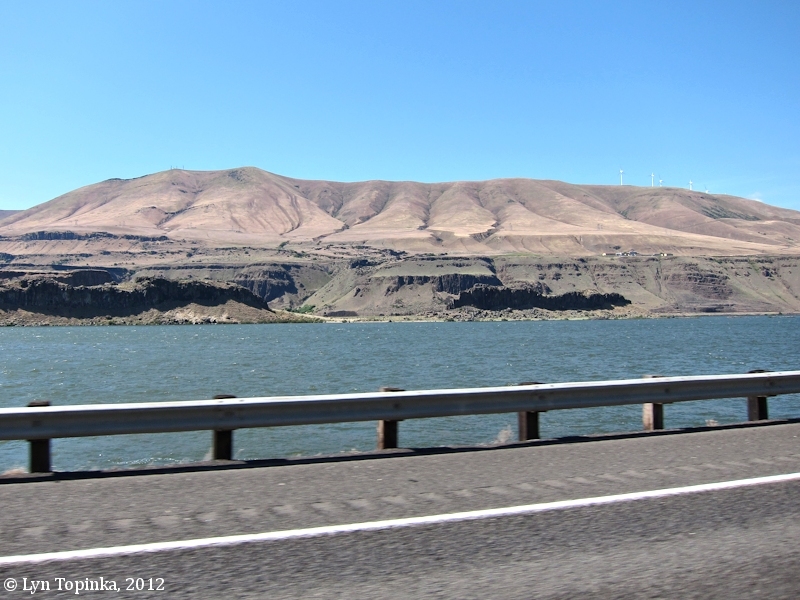 They camped on the Oregon side of the Columbia, upstream of the mouth of the Deschutes River, closer to today's John Day Dam. Lewis and Clark's campsite of April 22, 1806 was upstream of the John Day Dam and across from the mouth of the John Day River. 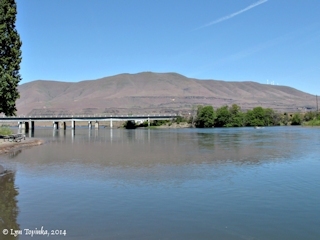 Click image to enlarge Haystack Butte, Washington, as seen from the Deschutes River, Oregon. Image taken May 12, 2014. 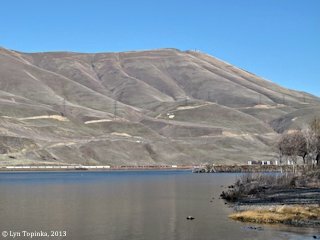 Click image to enlarge Haystack Butte, Washington, as seen from Celilo Park, Oregon. 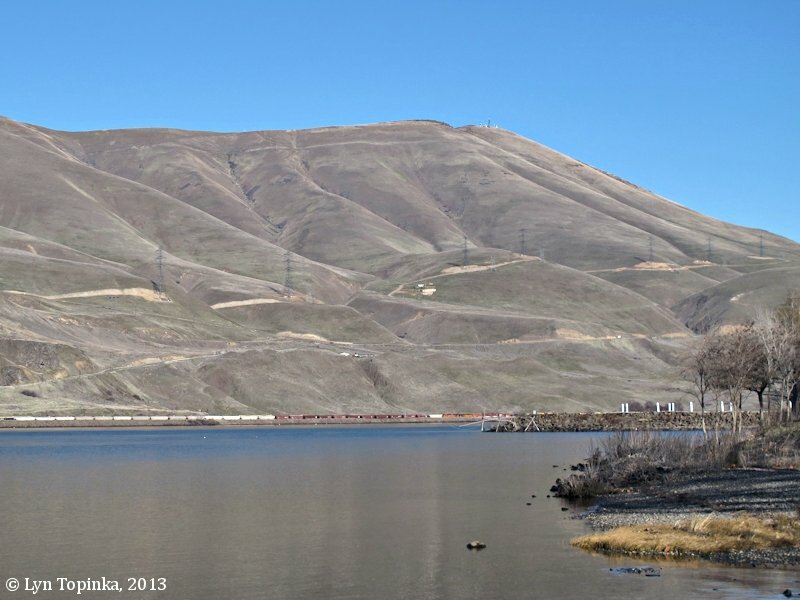 Lewis and Clark's campsite of April 21 was approximately 2 miles upstream of Wishram, at the base of Haystack Butte. Image taken February 8, 2013. On April 22, 1806, as the men set off from their camp at the base of Haystack Butte, one of their horses bolted resulting in a delay of Captain Lewis and some of the men. 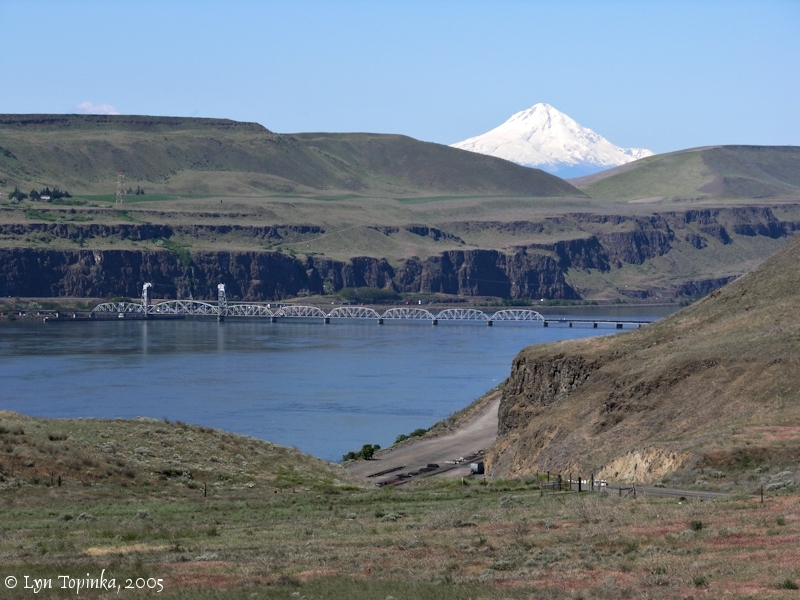 While waiting Captain Clark climbed up a "high hill" and viewed not only the Deschutes River but also Mount Hood, Mount Jefferson, and snow on the Cascade Range. Click image to enlarge Mouth of the Deschutes River, Oregon. View from Washington State Highway 14 in the Haystack Butte vicinity, near the April 21, 1806 campsite of Lewis and Clark. Miller Island is tip in lower left corner. Image taken May 24, 2005.
we took breakfast and departed a few minutes after 10 OClock. having nine horses loaded and one which Bratton rode not being able as yet to march; the two canoes I had dispatched early this morning. at 1 P. M. I arrived at the Enesher Village where I found Capt Clark and party; he had not purchased a single horse. ... we soon made the portage with our canoes and baggage and halted about 1/2 a mile above the Village where we graized our horses and took dinner on some dogs which we purchased of these people. after dinner we proceeded on about four miles to a village of 9 mat lodges of the Enesher a little below the entrance of Clark's river [Deschutes River] and encamped [Haystack Butte area]; one of the canoes joined us the other not observing us halt continued on.